As if airports weren’t already packed with enough harried hordes in a frantic dash to reach their destinations, a Chicago startup called Modobag wants to turn your local terminal into the Daytona 500. Modobag’s eponymous creation is a piece of motorized carry-on luggage that can be mounted and ridden like a go-kart. The device reaches speeds of up to eight miles per hour and can travel up to six miles on a full battery charge. Modobag is currently making its final lap around Kickstarter, where it has reached a little over 10 percent of its $160,000 goal with just 11 days to spare. The device is the brainchild of Chicago inventor Kevin O’Donnell, who describes his a-ha moment thusly: "Why can’t we ride our luggage and get to where we’re going faster with less stress?" If the notion of zipping through crowds on a motorized box doesn’t necessarily sound stress relieving, just take a look at the company’s promo video, where riders smile gleefully as they pull sharp turns and then, upon boarding, stow their baggage seamlessly overhead. In a bid that could encourage riders to consult their smartphones while driving, Modobag has also launched an accompanying app that monitors battery life and speed. 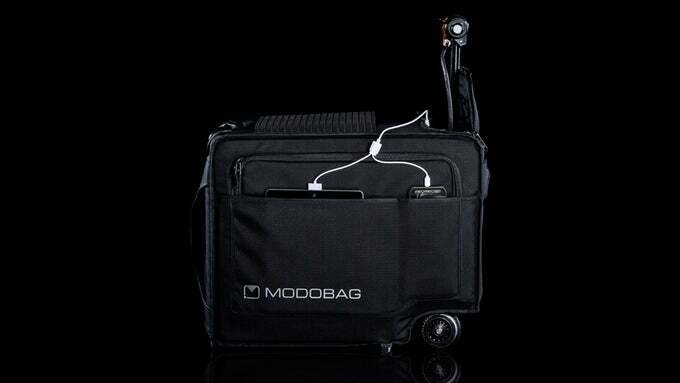 The device, which weighs 20 pounds empty and is TSA compliant, according to Modobag, also features GPS tracking and two USB ports for charging electronic devices. O’Donnell has brought his vision to life alongside Boyd Bruner, a college friend and competitive motorcyclist. Two models are currently available. For $999, Kickstarter donors receive a standard Modobag, which accommodates riders up to 200 pounds. A Modobag Max, priced at $1,299, accommodates riders up to 260 pounds.